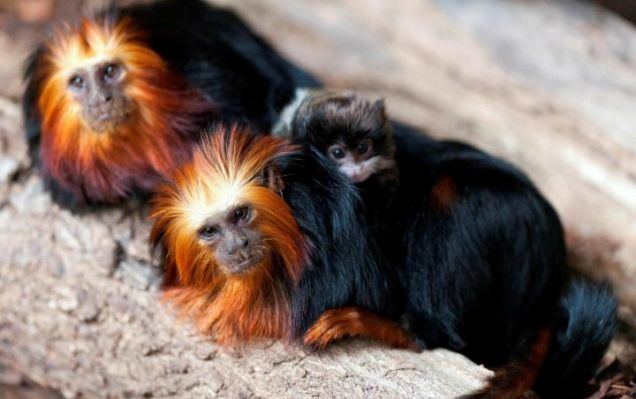 Staff at a zoo in Jersey in the Channel Islands are ecstatic at the birth of a Tamarin Monkey. The Black Lion Tamarin comes from Brazil but there are only 1000 left in the wild because their habitat has been destroyed by loggers. How sad that the only specimens will be in zoos! Will the logging of jungles ever cease? Oh sorry, of course they will – when they are all chopped down! And then everyone will be mighty happy. The picture inserted is of rare pied tamarin monkey twins born in Colchester Zoo in June 2010. It is thought the population of the pied tamarin in the wild has fallen by half over the last 18 years. The pied tamarin, which originates from the Manaus region of Brazil, is an endangered species on International Union for Conservation of Nature Red List. “There’s a European endangered species programme for them, so the studbook keeper looks to match genetically compatible animals together,” said Anthony, the zoological director. Because of their nervous disposition, pied tamarins are notoriously difficult to breed, according to Anthony. So this is another case of a species being almost wiped out because of their habitat being destroyed. In July, 2010, London Zoo’s golden-headed lion tamarin adopted a baby emperor tamarin, when it was just two weeks old. 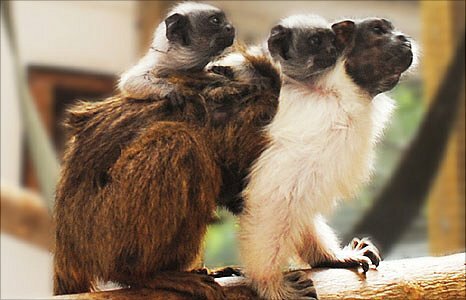 Emperor tamarins, native to South America, are generally brought up by their fathers who carry them until they are old enough to fend for themselves. However, the childless golden-headed lion tamarin monkey took a shine to the grey youngster two weeks after it was born at London Zoo. Senior keeper, Lucy Hawley, said: ‘At first the father of the emperor tamarin baby was a little nervous about Juanita but now they all seem to get along just fine”. It certainly doesn’t pay to be afraid of anything. It does seem that you’ll attract what you’re afraid of. At least that seems to be the way with this British tourist who was attacked by monkeys. I can sympathise with her as I myself was attacked by a cranky monkey in Thailand, that clung on to my arm and gave me a big bite. I still have the scar. The 56-year-old was surrounded and attacked by a group of macaques as she sat on a towel while on holiday in Thailand. She had a fear of primates after her father brought up a ‘positively evil’ chimpanzee. So she and a friend joined a tour on Monkey Island, off Phuket. ‘I thought I was heading for safety under this rock in the shade,’ said Mrs Darwell. ‘The next thing I noticed, this monkey walked up next to me and I thought, “Oh dear”. ‘Then, the monkey took my wrist and pounced on my right arm, sinking his teeth in and hung off it. He wouldn’t let go – he was locked on. Mrs Darwell, of Peterborough, collapsed and was taken to hospital with puncture wounds and bruising. Last week I entered this post but it was buried under another item. It seems bad enough to repeat it this week. Don’t we have enough problems with guns already? Sure, there are other weapons freely available, but guns are particularly lethal and in the hands of children, neverlone adults, they are a recipe for disaster. Sadly, the recent change of government has given a higher profile to a very unsavoury political group – The Shooters’ and Fishers’ Party. There is a revolting photo in circulation of their leader, Robert Brown MP, crouching proudly beside an elephant he has slaughtered and then later, hauling away its tusks. It is a very sad day indeed when a political party with the sole goal of ensuring that as great an area as possible is made available for blood sports, should be able to gain so much power. Extraordinarily, they want the introduction of hunting classes in schools! Their list of demands go on and on and although they are sugar coating their requests under the guise of ‘saving’ Australia from the terrible threat of feral animals, their only goal is to indulge their blood lust by killing as much as possible with the help of their dogs. Among other demands, they want national parks opened up to them and their dogs. Just imagine – the very place which has been set aside for native animals – the only ‘safe’ place for animals now that their habitats have been destroyed to build apartment blocks – is now going to be invaded by brutes with guns and dogs! How sad that we can’t and won’t protect our native animals. The Party asserts the right of the law-abiding citizen to own and use firearms. So they want everyone to be toting guns, and for children to learn about killing at school. Is there enough wildlife for everyone to kill? They won’t be surprised when children bring guns to school and shoot each other, will they? Professional safari hunters, recreational hunters, sports shooters, or weekend warriors? This Bill would overturn all environmental legislation protecting our remaining wildlife in NSW. It is repugnant. This proposal is nothing to do with noble gesture of taking on the task of the government’s culling feral animals in National Parks. The Game Council in this self-interested set of demands, simply wants to give its weekend warrior member base open slather access to shoot almost anything and everything in the bush. It would be 24/7 open season on wildlife perpetually across NSW every day of the year. Every weekend would be weekend warrior party time in the ute with the spotties and the beers and the guns – just like in the good old days eh? In doing so, The Game Council and the Shooters Party have shown their true colours. The Game Council’s objective is to provide for the effective management of ‘introduced species’ of game animals. By advocating the hunting and shooting of native animals and birds is outside its ‘introduced species’ charter. It will be truly unfortunate if this group of rednecks get their way! What they stand for is repugnant to the majority of the population. Dr John Hadley from the University of Western Sydney has proposed legal rights for Australian native animals. He says that Australia has the largest loss of biodiversity in the world and this is due to habitat loss. Naturally, farmers aren’t having any of it. When I was driving home late last night I heard a radio announcer debating the subject of who ‘owns’ the world. He scoffed that snakes and frogs don’t own the world. We do! How interesting. At last look I thought that the world belonged to everyone and everything that exists in it. I didn’t know that people, who incidentally are only a relatively recent addition in terms of the planet’s timeline, had special ownership rights. And if we are under that ridiculous illusion we can so easily be taught a jolly big lesson. We have already proved that we are powerless in the face of nature’s wrath. A single tsunami in Japan wiped out tens of thousands of people. Tornados wiped out homes, crops, farm animals as well as people. Floods have collectively killed hundreds of thousands of people all over the world from Sri Lanka, India, Pakistan to Australia just in the last two years. In the face of earthquakes we have also proved to be powerless. And we think we ‘own’ the world? If we did then these problems would surely not exist. Would they? And yet, if the oceans were to raise 10 metres in one night I wonder how many islands would be wiped out and how many people drowned. No problems – we own the world and we’ll make sure THAT doesn’t happen. The same radio announcer was also furious that Baulkham Hills Shire Council has effectively put a green ban on all its residents. The locals who have huge blocks of land of up to five acres, have found that overnight huge swathes of their properties (the parts with trees on them that is) have been slapped with a no destruction order. So they are banned from cutting down the trees or subdividing the land. Interesting! Of course they mostly undoubtedly bought the properties with the express intention of doing just that in the fullness of time. However, I have to question the consistency of councils’ and governments’ attempts to preserve the environment. Just down the road at Lane Cove, the State Government has still maintained its rezoning of Batten Reserve and appears to have the full intention of chopping down all those trees and killing all that wildlife. So where is the logic? Book number nine, The Doofuzz Dudes and the Ozone Thief, is now in production! Hopefully it will be published by July this year. When Toby and Huon Doofuzz’s cousin, Jared comes to visit, he brings a kooky new invention with him – a set of repairing arms! As usual, nothing goes as planned, and after an embarrassing incident where the repairing arms smash Mrs. Doofuzz’s antique vase, Jared seriously considers giving up inventing. Before too long the Dudes are thrown headlong into an incredible adventure when Mr. Pillari’s magic display goes horribly wrong and the Dudes find themselves on the way to the Planets Zok and Joh25n. Even more disturbingly, they have a nasty encounter with the Moondarians’ sworn enemy, the horrible Prince Florian and his scary girlfriend, Acid-Rayne. How did Prince Florian escape his space jail? And who are the blue Twaddlers? Will the magical Oruclees survive the catastrophe on Planet Joh25n? Who is Raindrain the Drainbrain and what part does he play in the dramatic situation? And will the Dudes escape their next encounter with the creepy Space Spiders? Most importantly, who is the Ozone Thief and can the damage be repaired? 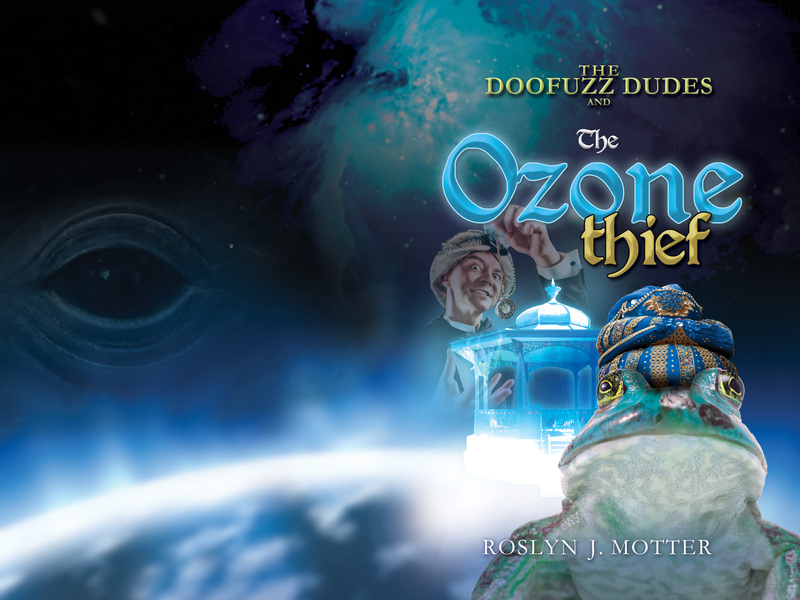 To find out the answer to these questions, and more, read the ninth book in the Doofuzz Dudes series, The Ozone Thief. A little bit of good news on the subject of cane toads which have devastated wildlife across Australia since their introduction by some lame brained people decades ago. A clever person attached a radio tracking transmitter to a cane toad which was found in Sydney. That cane toad led the trackers to its breeding grounds where its tadpoles were found and hopefully fed to some hungry fish. We don’t need cane toads in Sydney or anywhere at all. Everyone seems to hate rats but, quoting from the Daily Telegraph – Rats love drains and so do toads and both come from the Northern Hemisphere so rats have developed a tolerance for the toad’s poison. A researcher was following a cane toad fitted with a transmitter and he found it in a drain, killed by a rat. So rats aren’t as bad as you thought – are they? Also the threatened native green and golden bell frogs are apparently eating the toads’ tadpoles. That is interesting as I’ve read that even the cane toads’ tadpoles are poisonous. A labrador is being used by Sutherland Council to sniff out cane toads and a second dog, a kelpie, is also being trained. What do you make of the American lady who has been caring for a disabled kangaroo as if it was her own child? Irwin, the kangaroo, suffered brain damage when he hopped into a fence at a wildlife sanctuary a year ago. Christie Carr took over his care and had a bolster seat fitted in her car with a hole for his tail. She dresses him in suits and pyjamas and feeds him very inappropriate food – cheezels and chips. However, there is no denying her love for Irwin, the red kangaroo, and yet her local council is demanding that she insure it for $50,000 per year to ensure it doesn’t attack anyone. She has had him neutered so that he won’t become agressive and in fact, he is undersized for his age and won’t be growing to full size due to the fact that he has been desexed. Given that in Australia we hate our national icon, the Kangaroo, and at any given moment there are hundreds of hunters out there blasting them to smithereens whilst every morning the ones that got away are lying squashed on our national highways, it is a wonderful thing that someone really does love their kangaroo pet. Sure, Irwin shouldn’t be wearing a suit and pyjamas and eating cheezels, but who could deny the love of a woman for a disabled animal who would undoubtedly have been euthanized if it had been left to its own devices? Let the lady keep her pet and congratulations to a woman who really does love a kangaroo, instead of eating it as we do in Australia! I just read the following news, so it seems that Irwin has been saved! The winner as per usual, is the insurance company. BROKEN ARROW, Okla. — An anonymous donor has purchased a $50,000 insurance policy to help an Oklahoma woman keep her pet kangaroo as a therapy pet. Governments care about the environment. Right? They care so much that in Australia they’re bringing in a carbon tax to save the environment. Right? Take the situation in Lane Cove – and no doubt in many other areas right across Australia. The Former Labor State Goverment rezoned the bushland in Batten Reserve to allow the building of 6 storey apartment blocks in it because it is a bush fire risk. Really? How incredible. Imagine that. Based on that analysis of the situation bushland will be hacked down everywhere. It could all go up in flames. Best to chop it all down to be on the safe side! According to http://smh.domain.com.au/real-estate-news/bushland-doomed-to-build-more-apartments-20110323-1c5if.html the battle over the reserve is another flashpoint in the government’s campaign to squeeze more people into Sydney by requiring all councils to zone land for medium and high-density development to provide for 40 per cent growth in population over the next 30 years. How wonderful! I nearly screamed on Friday after sitting for one and a half hours in a traffic jam up Carlingford way. How much more terrific it would have been if there were 40% more cars in it! But if you value your local bushland, write to the federal Environment Minister, Tony Burke, and lobby the new state Liberal government to protect the bushland by reversing the earlier decision by the Department of Planning to rezone the Batten Reserve. This is a very serious situation as it will be the bushland in your local council area that will go next. Otherwise how will there be enough room to increase Sydney’s population by 40% over the next 30 years. And won’t it be delightful to live in Sydney then? It’s impossible to drive on the roads now! Imagine how public services will cope! And I can’t help wondering how the proposed carbon tax to ‘save the environment’ meshes with this decidely destructive environmental proposal? Actually I quite like spiders. Don’t get me wrong – I don’t want them crawling up my arm or climbing into my bed. But I never kill a spider; I get a broom and catch the spider with it and put it out the window. How hard is that? We ought to realize that spiders are not anxious to tangle with us either. They want to save their valuable venom for catching their prey. On that subject and as an aside, do you know what is a very valuable anti-venom that can be used if you don’t know what spider has bitten you? Vitamin C! My friend who runs a farm was horrified when her dog was bitten by a snake and was rapidly fading away in front of her eyes. She didn’t have time to take it to the vet as the dog wouldn’t have lasted that long. She had no idea what snake had bitten the dog either. She had read that Vitamin C is a universal anti-venom so she went to the fridge where she’d be keeping a couple of Vit. C injections for exactly this occurrence, and injected the dog behind its shoulder. Within a quarter of an hour he was right as rain. Completely cured! Vitamin C would work on spider, snake and tick bites. Beats conking out! But you’d need to keep it in your fridge. Vit C injections can be bought from stock suppliers. Well, back to my talk on spiders. 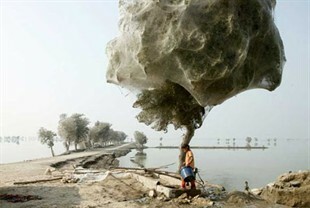 Millions of spiders have cocooned entire trees across Pakistan in a thick coating of web. The webs are also chockers with dead insects. The spiders were forced into the branches by last year’s devastating monsoon floods. The spiders climbed into the trees in late July last year when monsoon rains flooded the regions of Sindh, Punjab, Khyber Pakhtunkhwa and Balochistan. The water took so long to recede that the spiders soon coated their new homes in a thick mesh of web. The locals in the Sindh province are happy the spiders have stayed as they believe that the spiders’ webs have reduced the mosquito population, which carries the deadly malaria virus. So this is a good thing! Be kind to spiders! What do you think of someone who could kill a swan? Well yesterday some horrible teenagers in Melbourne, stoned a female swan to death. What was even worse, she was caring for her eggs. Her partner has been caring for the eggs but he has to leave the eggs to get food sooner or later. Read more about it here. http://www.smh.com.au/environment/animals/youths-stone-swan-to-death-20110407-1d55e.html?amp Swans mate for life and now the poor male is waiting for his partner to return. He has no idea she is dead. What a heartbreaking and disgusting situation. As awful as it is, it is by no means the first time such a thing has occurred. See http://www.pet-abuse.com/cases/1713/RI/US/ These low lives killed a swan the same way just recently. This time the act occurred in Providence, U.S. The Decorah Bald Eagles at Eagle Manor via the Ustream Live cam are thriving as a family. Thanks to Bob and the Raptor Resource Project in Iowa, bird watching of these animals is possible. Is it the End of the World or Just the End of Humans? So what on earth is happening to the world? Earthquakes, tsunamis, nuclear radiation blowing to a city near you, floods, fires, civil unrest in the Middle East and birds and fish committing mass suicide. A Gnostic friend says this is based on cycles that we pass through as a solar system and planet. Also, the karma of the planet plays a big role as well as the consciousness of the citizens of this planet. We are in the last stage of the Aryan race and this will take awhile as everything escalates over the next decades. Everyone has enough time to change but not enough time to play around. Ultimately, there are great forces organizing matters and protecting those needed. After the great cataclysms there will come a new race and epoch known as the Koradi race and we all get another chance on Earth. My good friend Mohamed (a Muslim) says that he believes the Day of Resurrection is coming. Apparently the sequence of events is the annihilation of all creatures, resurrection of the body, and the judgment of all sentient creatures. The exact time when these events will occur is unknown, however there are said to be major and minor signs which are to occur near the time. Someone else said that we’ve been poking things into the earth and drilling earth’s minerals but giving back nothing for too long and this is the earth finally speaking. • When all the trees have been cut down, when all the animals have been hunted, when all the waters are polluted, when all the air is unsafe to breathe, only then will you discover you cannot eat money. The Mayan calendar points to a turning point or possibly the end of the earth on 21st December, 2012. Were they out in their calculations or is there worse to come? However, according to http://www.december212012.com/articles/news/Mayan_Prophecy_Predicted_Massive_Earthquake.htmapparently Mayan prophesies predicted a massive earthquake at the same time as the Japanese earthquake. For more opinions on the current situation go to http://www.december212012.com. There is no doubt that we have mistreated the earth. For starters we have badly treated the indigenous inhabitants of every country. The American Indians, the Mayans, the Incas, the Australian Aborigines, the indigenous inhabitants of Malaysia, the natives living in the Amazon Rainforest etc etc. We (the very advanced peoples of the West) wanted their land and their gold and silver if they had any, and nothing stood in our way. Through treachery and government ratified wholesale slaughter we wiped them all out, sending the remnants to reservations, and then we took their land. • Treat the earth well: it was not given to you by your parents, it was loaned to you by your children. We do not inherit the Earth from our Ancestors, we borrow it from our Children. We see the land as our personal property. We buy our block and we receive a title deed for it. Billions of trees are chopped down annually to make way for new housing. Furthermore, the new houses in Australia are called ‘MacMansions’ as they are enormous and take up every centimetre of space on the block. No trees or garden can exist as there is no room left. Blocks of flats are popping up everywhere, creating a pressure cooker environment for the residents. They live in such close proximity to their neighbours there is no privacy. Fights and quarrels abound. There is barely room for gardens in these developments and no one is allowed to keep a pet. No one is happy. They have to work longer and longer hours to pay for incredibly expensive properties. Everyone is increasingly intolerant as demonstrated by the numerous incidents of road rage or murders which are often committed by family members or friends. Mental health has become increasingly unstable. Young people are turning to mood alterating drugs and older ones to prescribed narcotics. Forget birds. They are of little consequence in the modern world. Their trees are chopped down so they can’t nest and have nowhere to perch. The humble Christmas beetle which was ubiquitous not so long ago in the Sydney region, is no longer seen. According to the entemologist Stephen Fellenberg, they develop under the earth for three years before they emerge. Unfortunately due to the extensive housing developments in Sydney, the trees under which they developed have been chopped down and the earth concreted so that’s that. Of course this situation is hardly unique. Every native animal in Australia is under threat by rampant urban development or mining. And of course this situation is repeated in every country on earth. The seas are full of seeping oil, plastic and rubbish and now contain at least 400 dead zones in which there exists nothing but jelly fish. We have plundered the sea of fish. The food chain in the ocean has been broken into pieces. Blue Fin Tuna are almost extinct but we are still compelled to fish for them as they sell for a lot of money and well, there are many people in Japan who really like eating them. Sharks have their fins hacked off and are tossed back alive into the ocean to die. Orange Roughies are not even allowed the chance to reproduce as they are caught before their reproductive age is reached (25 years of age). So how long do we think we can carry on in this fashion? Well, nothing is going to change on our part. We will continue to chop down trees willy nilly. Developers will continue to develop. However, the earth could be striking back. The first moves have been made and the results were not pretty. The thing is – when the earth retaliates it can do an awful lot of damage in one hour! Maybe we should be following the Indians’ lead and live in teepees, or the Aborigines and live in bark huts or lean-tos? In an earthquake they don’t hurt if they fall on our heads. No sooner had I written this blog than I opened the Sydney Morning Herald and read that Lane Cove Council has called on the NSW government to reverse its zoning to allow 2500 new apartments after a consultant’s report suggested removing more than 80% of trees in an adjacent reserve to reduce the risk of bushfire. Well it’s hard to know what to say to this. It is definitely a super idea to cut down all the bush just to prevent a possible bushfire! I’m being sarcastic as I can’t imagine how anyone can suggest that with a straight face. Anyway, it’s a most convenient idea as chopping down all the bushland will provide heaps of room for housing – 2500 apartments to be precise. And of course you can imagine how super it will be to collect rates from an extra 2500 unit holders. On the one hand the government wants to hit us with a carbon dioxide tax but they don’t see a problem with chopping down a nature reserve which is absorbing carbon dioxide and converting it to oxygen! Well I’m sure a tax will fix everything up. It will be business as usual as we continue to chop down every tree in sight and pay a tax to make ourselves feel better about it. Ha! What a joke. Hens on grass! How extraordinary! When you go to the supermarket and buy a dozen eggs, a bottle of milk, a carton of soymilk, a bag of peaches, a fish or pork chop for dinner and a newspaper you won’t be thinking about the inside story behind these harmless purchases. The truth is that with intensified farming, the story is not a pleasant one for animals. People no longer grow enough for their family in their own gardens as would have been the case a hundred years ago. Now farmers have to service a market of potentially millions of people. Food is mass produced with all the nastiness that this entails. Animals are treated as disposable products. Let’s take the first item on our shopping list – the eggs. In Australia we eat 12 million eggs every day. All over the world billions of hens are sitting in cramped little cages under constant artificial light, unable to move as they lay egg after egg. They never see grass or natural light. They will never walk. Their claws are long and so twisted that they never could walk even if they wanted to. Their feathers have fallen or been pecked out. They have a very short life span. As soon as they stop laying their life is worthless to a farmer. They are slaughtered straight away. Of course, because roosters can’t lay eggs then they are totally disposable. At one day of age the males are separated from the females and are stuffed alive into a machine which mashes them up. The baby hens are then debeaked with a hot bloody blade at one day old so that they won’t peck each other. Antibiotics are added to their feed to prevent against infections. Free range hens are in no better situation. Hundreds of hens are cramped together in a confined space in a shed. There’s no such thing as hens running freely through the fields. So, you say, at least they lay nice eggs. But do they? The yellow of the yolk (which incidentally should be orange rather than yellow) is formed from eating green food – ie grass. Since there is no grass in either of these constricting circumstances, food colouring is added to their food to ensure that the yolk is yellow. Now isn’t that a healthy food choice? If you are a believer in the suffering of animals permeating their flesh or their by products, then an egg would be a true instrument of suffering. That can hardly enhance the health of the eater. I choose to have hens in my own backyard so I can have confidence that they are happy and live carefree lives. As for milk, the second item on the list, you’d think that would be a harmless purchase. There has been some talk lately about poddy calves. I recently spoke to a dairy farmer and she said that they have so many poddy calves they don’t know what to do with them so they hit them on the head and killed them all. She said that otherwise they’d never be able to sell them as there would be more calves than the market can accommodate. Given the chance, cows nurture their young and form lifelong friendships with one another. They play games and have a wide range of emotions and personality traits. But most cows raised for the dairy industry are intensively confined, leaving them unable to fulfill their most basic desires, such as nursing their calves, even for a single day. They are treated like milk-producing machines and are genetically manipulated and pumped full of antibiotics and hormones that cause them to produce more milk. Cows produce milk for the same reason that humans do—to nourish their young—but calves on dairy farms are taken away from their mothers when they are just 1 day old. They are fed milk replacers (including cattle blood) so that their mothers’ milk can be sold to humans. Female cows are artificially inseminated shortly after their first birthdays. After giving birth, they lactate for 10 months and are then inseminated again, continuing the cycle. Some spend their entire lives standing on concrete floors; others are confined to massive, crowded lots, where they are forced to live amid their own waste. Cows have a natural lifespan of about 20 years and can produce milk for eight or nine years. However, the stress caused by the conditions on factory farms leads to disease, lameness, and reproductive problems that render cows worthless to the dairy industry by the time that they’re 4 or 5 years old, at which time they are sent to be slaughtered. Painful inflammation of the mammary glands, or mastitis, is common among cows raised for their milk, and it is one of dairy farms’ most frequently cited reasons for sending cows to slaughter. In Australia there has recently been a price war conducted by Coles. A litre of Coles milk has been available for sale at $1 a litre, grossly undercutting other retailers. Coles has been prepared to wear the loss as it brings people into their supermarkets, however in due course this will directly affect the Australian dairy farmers who will adopt farming policies to further cut costs. Cows will be the end sufferers. There is a Buddist line of thought that just as the eggs we eat are created in sad and deformed bodies lead to a toxic product, while cows suffer on factory farms, humans who drink their milk increase their chances of developing heart disease, diabetes, cancer, and many other ailments. But are soy products better? Well no soy beans are tortured, that’s for sure. However there is lots of evidence to suggest that they are also very bad for the environment. In Argentina after the collapse of the economy after the floating of the peso in 2002, the Argentinians were coerced (no doubt by the IMF) into chopping down their forests and planting soybeans to feed European pigs. Also, a major cause of destruction of the Amazon jungle has been for the production of soybeans. Now Indonesia intends to raze millions of hectares of jungle in territory they own in New Guinea to grow, amongst other things, soybeans. When countries have financial problems, the IMF (International Monetary Fund) moves in and tells them to destroy their environment to grow soy beans and palm oil plantations if they want money. Hence we have the deaths of untold billions of reptiles, birds and wild animals on our hands. We can expect a lot of environmental problems to the world to emanate from the Amazon very soon and the result will not be pretty. At this moment the Amazon is poised on the edge of turning from being a carbon sink to a carbon source. When this happens world temperatures will escalate alarmingly. As for whether soybeans are better for your health, the vast majority of soybeans are genetically modified. From a health perspective this does not seem to be an ideal situation. Read more at http://www.slate.com/id/2195690/ where a more thorough comparison is made between the environmental pros and cons of dairy milk and soy milk. In my next blog I will discuss what could possibly be wrong with those peaches, fish, pork chop and newspaper.